Update: Guess who will be on the new Bobby Flay show, Three Days to Open starting July 20 at 10 pm? 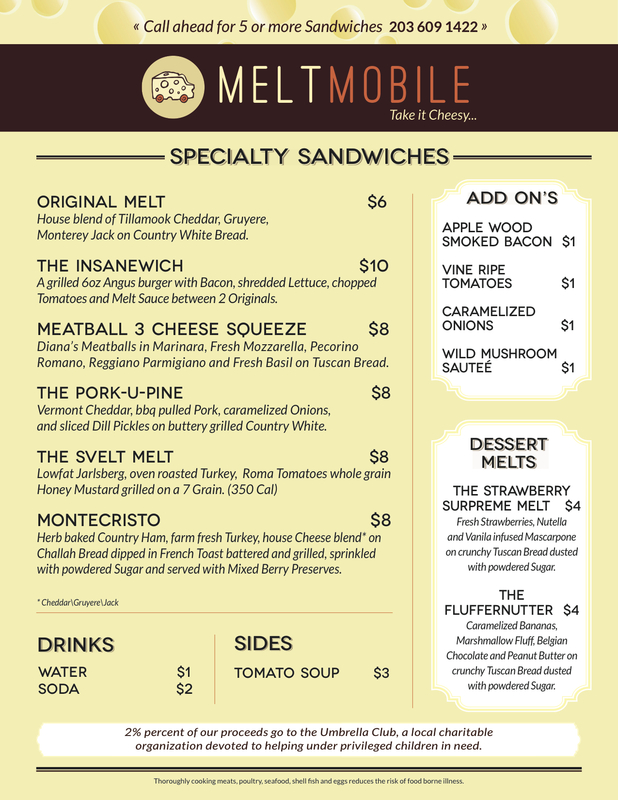 Yup, details here about Melt Mobile working with Bobby Flay and the surprise cheese visit. Last April 1st we told you all about food trucks in Fairfield County, but they were all just cruel April Fool’s jokes. Po’ Po’ Porridge…did you really think this was actually one? Weirdos. Well, Melt Mobile is no joke and is now open. The original menu had 12 gourmet grilled cheese sandwiches, but they’ve tightened things up and are now featuring 8 sandwiches. Now, these aren’t any old ordinary boring grilled cheese sandwiches. These are re-donk-ulous. Plus, they’ve got a killer tomato soup that rocked our worlds. You’ll also be able to build your own sandwich with Applewood smoked bacon, vine-ripened tomatoes, caramelized onions, and sautéed wild mushrooms. When Bobby Flay rolled into town we had all the add-ins and it was an amazing experience. Find Melt Mobile at Veterans Park/Landmark Square on Atlantic Street, across from Old Town Hall. Keep up to date with their FB page and you also might learn about daily specials and even if you can see them during a Friday or Saturday night. Yup. That’s why you’ve gotta check them out. The Meatball 3 Cheese Squeeze: Diana’s meatballs, basil marinara, Parmesan/Romano blend, ricotta, and mozzarella on grilled ciabatta. The Fluffernutter: creamy peanut butter, melted bittersweet Belgian chocolate, marshmallow fluff, and caramelized bananas on crunch Terra Nova bread sprinkled with powdered sugar. The Pork-U-Pine: Vermont cheddar, bbq pulled pork, caramelized onions, and sliced dill pickles on buttery grilled country white bread. Please note they donate 2% of their proceeds to Umbrella Club of Stamford, an organization that helps community families and children in need. It’s only open 11a-4p monday-friday? I’ll never get to have it so that doesn’t help me, stupid hours. This Mobile Food Restaurant is going to be awesome! As a Mobile Food Consultant, people ask about the staying power of food trucks – LOOK AT THIS MENU!!!! When you treat your Truck as a MOBILE FOOD RESTAURANT – A BUSINESS – YOU ARE ENSURING THE STAYING POWER OF YOUR TRUCK, ENSURING THE SUCCESS OF YOUR TRUCK, AND HELPING TO ENSURE THAT FOOD TRUCKS ARE HERE TO STAY! Mobile Food Restaurants are a new and very important EXTENSION OF THE RESTAURANT INDUSTRY!!!! We are demanding that people across the country and throughout the world – TAKE A SERIOUS LOOK AT THIS NEW, AGAIN, EXTENSION OF THE INDUSTRY! As a Mobile Food Consultant, my goal is to get you operational within 90 days without breaking your bank!!!! Hi Laura Im thinking about getting into the food truck business and may want to pick your brain but the website you listed is nonfunctional, are you still in business and if so what is the best way to contact you. this is bad news for my cholesterol! Food trucks have always had a tough time in Stamford because the restaurants (who are paying outrageous rents have complained very loudly)…i love food trucks and miss some that i used to see on Atlantic (a hot dog truck with a red onion sauce to die for was one). Ah, a grilled cheese sandwich here or there will be okay for you, Señor Whitemist! ;) We saw a crepe food truck in Fairfield today, so it’s exciting to see this gourmet grilled cheese one! :) We really wish them lots of success, they are nice people and who doesn’t love grilled cheese? :) What was the name of the hot dog truck? No probs. Yeah, would be nice for hot dogs! Wow, how awesome would that be? Sweet Jeebus!! This is amazing. I can’t wait!! And yes, tater tots > everything in the world. PS: How do you guys get all this breaking food news?? I’m with Kristien on both counts. Plus tater tots. I see multiple trips in my future.